Here, finally, is my third Craft it Forward gift. This one was made for Shauna, of Shauna's World. 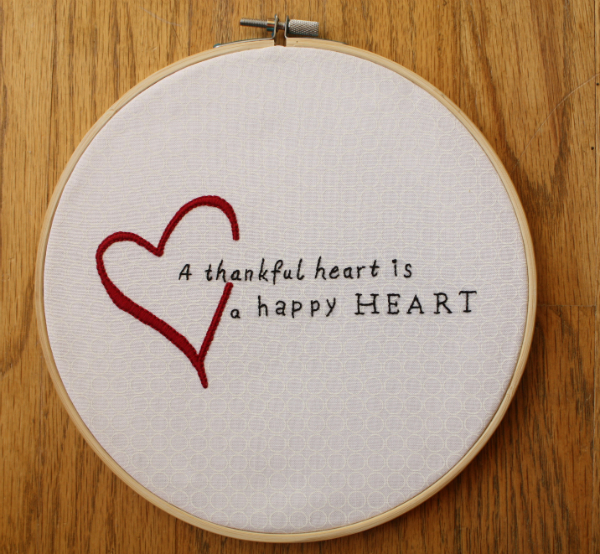 I had a hard time deciding what to make for Shauna, until I noticed how often she was linking to Yvonne's 'Quilty Thankful Thursday' at Quilting Jet Girl. 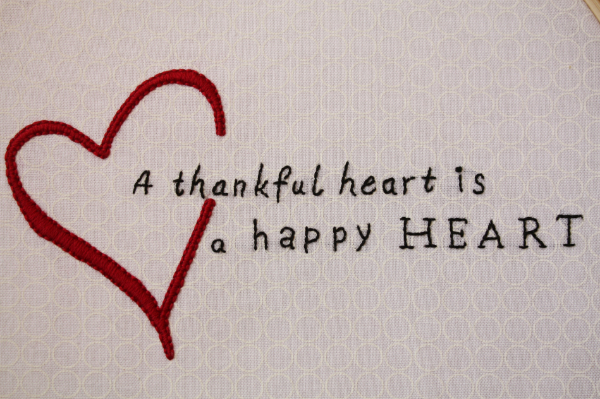 Then, when I saw this graphic, I knew it would make a great embroidered design for Shauna. I framed it in a hoop, which seemed like just the simple finish this design needed. It was my first time finishing a hoop, so the back isn't quite as neat as I would have liked. 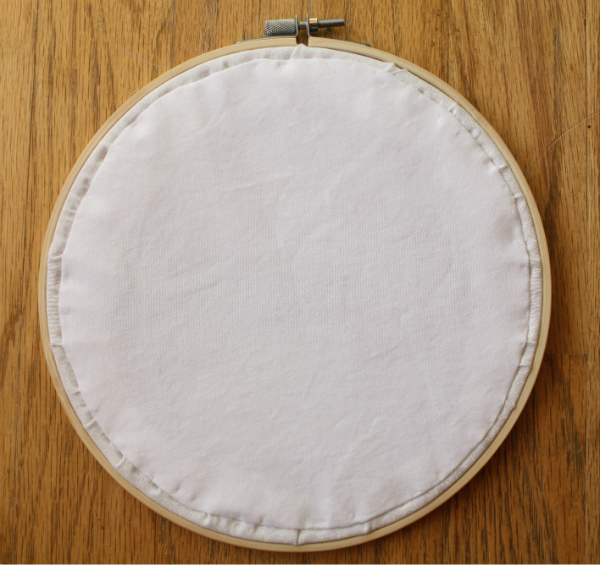 It won't be my last time finishing a hoop this way, though, so hopefully I'll be able to make improvements next time. I really enjoyed making this for Shauna! It also feels good to finally have all three gifts made and sent! I felt guilty about how long it took me to finish each one, even though I really liked working on all three projects. I think sometimes I'm too quick to chase after the next new project, which leaves current projects collecting dust. Do you do that, too? Which projects have you left collecting dust lately? I like the clean lines of this embroidery. I too think it's important to take stock and be thankful. Love the embroidery art. How did you finish the back? I have a couple of items in hoops but just never look at the backs!!!! Great idea. I'm sure she'll love it. Your embroidery skills are amazing, Leanne. You chose just the right saying and it looks fantastic! Your embroidery is so beautiful it is almost hard to believe it is done by hand. Great job! What Jasmine said! WOW! Beautifully stitched! That will be a very nice gift. It would take me forever. I don't have the ability to sit and finish just one project- from start to finish. Right now I'm trying to finish things already started and Not start anything new. ; ) it's been REALLY hard! It's lovely - I think this is spot on for Shauna and a great gift.